The annual Techie. Entrepreneurial. Nigerian. Talented. (TENT) gathering was hosted by Benson Idahosa University, Benin City, Edo –State. The 3 day event from Tuesday 18th –Thursday 20thNovember, 2014 was attended by about 320 students from 6 tertiary institutions across Nigeria. The theme for TENT 2014 was “See the Need, Take the Lead” with the aim of jump-starting the culture of ICT innovation amongst participants. The TENT gathering featured a wide-range of entrepreneurs, tech and IT experts who delivered the opening and closing keynote addresses as well as thetechie and entrepreneurial sessions. The opening keynote speakers at the #TENT2014 event were Gbenga Sesan (Executive Director, PIN), Bishop Faith Emmanuel Benson-Idahosa (President, Benson Idahosa University) and Sola Amusan (Microsoft’s Citizenship manager). Dr. Chris Uwaje (Founder/Chief Software Architect and CEO of Mobile Software Solutions) delivered the closing keynote. Day 1 of the event also featured a moderated panel of 3 young technopreneurs who discussed the major ingredients of building a successful brand in the Nigerian environment. These were Iyinoluwa Aboyeji (Co-founder, Andela Institute), Nkechi Okwuone (Open data manager, Edo State and Founder, Sabi hub) and John Obidi (Founder, ObidiSocial.com). Day 2 of the event was anchored by techie, entrepreneurial and innovation hub speakers: Osita Nwoye (Founder, Fonebase Labs), Oluseun Onigbinde (Co-founder, Budgit), Deji Aladejebi (Founder, DabarObjects Solutions), Esther Okoye (CEO, Distronet International), Femi Bayode (Freelance mobilizer), Ommo Clark (Founder, Ibez Technologies), Olufunbi Falayi (Co-founder, Passion Incubator) and Dr. Paschal Iwuh (Co-founder, The African Network). Participants were encouraged to be innovative and develop tech and business ideas that can change the world starting from their immediate environment. Speakers also urged them to begin taking the lead in the availing business opportunities in Nigeria. As part of Paradigm Initiative Nigeria’s mission to help young people discover opportunities, Adebola Agbaje (Project Manager, TENT/DigitalJobs) enlightened participants about the need to learn financial independence through #DigitalJobs. In addition, the final day showcased many young ICT talents amongst the participants. 12 students from the Obafemi Awolowo University and a student group of 3 individuals from Benson Idahosa University pitched demos of tech business ideas they are currently working on. Critical evaluation and feedback were given by the panel of mentors and tech experts present at the event. Students of the Obafemi Awolowo University, Ile-Ife, emerged winners of the Clash of The Campuses competition winning the Taiwo Bankole Ogunyemi Prize and a cash prize of N120,000. First and Second runners-up were Nnamdi Azikwe University and University of Benin who were also presented with awards and cash prizes of N70,000 and N50,000 respectively. According to PIN Executive Director, ‘Gbenga Sesan. “Our role is to help students make the best of their time in school so that they graduate with tech businesses or business plans that can attract investors. Our partners and event sponsors make this happen, and we are grateful for their continued support,” he added. TENT 2014 was supported by NITDA and hosted by Benson Idahosa University. If you would like more information about this topic or further project description on TENT; please visit www.pinigeria.org/tent. For more information please coRemove featured imagentact: ‘Debola Agbaje, Project Manger, TENT/DigitalJobs + 234 1 342 62 45, or e-mail info@pinigeria.org. Gentlemen of the Press and the general public, you are welcome to this ground-breaking Press Conference. The sole purpose of this event is to create ample awareness as part of the grand campaign process aimed at bringing the proposed Digital Rights and Freedom Bill to limelight. It is interesting to note that this Bill when finally passed into law could be the most comprehensive single legal framework in the world as far as ICT regulation is concerned. Although Nigeria has an ‘Internet Freedom Declaration’ almost similar to the Brazilian law establishing the principles, guarantees, rights and obligations for the use of Internet in Brazil, a more comprehensive legal regime is required to fill the obvious lacuna in our laws. Unlike Brazil, Nigeria’s example and leadership however is yet to be established in the domain of digital rights and online freedom. The Digital Rights and Freedom Bill will not only bridge the gap in the legal framework of the Nigerian digital future plans, it will also be a tool for education of the masses, law enforcement officers, as well as the judiciary. More importantly, it will re-orient the current trends of ‘repression-only’ legislation. It will proactively seek to protect, to promote and to safeguard the rights of Nigerians especially with regards to cyberspace. The Nigerian government is counting on a digital economy that it hopes will respond to its needs in wealth creation, citizen engagement, job creation, and economic and cultural innovation. This is evidenced by its plans, international engagements and ICT policies. It is envisioned that by 2020 Nigeria will be one of the 20 largest economies in the world, able to consolidate its leadership role in Africa and establish itself as a significant player in the global economic and political arena. However the perspective is challenged by the lack of a legal framework, especially that which proactively guarantees the rights and freedoms of the citizens online. In response to this conspicuous lack, a coalition of organizations, mostly Nigerian and Nigerian-led, have started an initiative towards a Digital Rights and Freedom Bill. NetRightsNG is a coalition of individuals, organizations, and entities who have joined forces to work with all stakeholders towards a Nigerian Digital Rights and Freedom Bill. It does not have any political coloration. NetRightsNG is open to Nigerians, Nigerian organizations or Nigerian partners who share common ideals and are willing to join forces and resources, and for use of digital tools for development in achieving this. The secretariat of NetRightsNG is hosted by Paradigm Initiative Nigeria (PIN). Stakeholders use mailing lists for communications and a web site is available on http://www.netrights.ng. 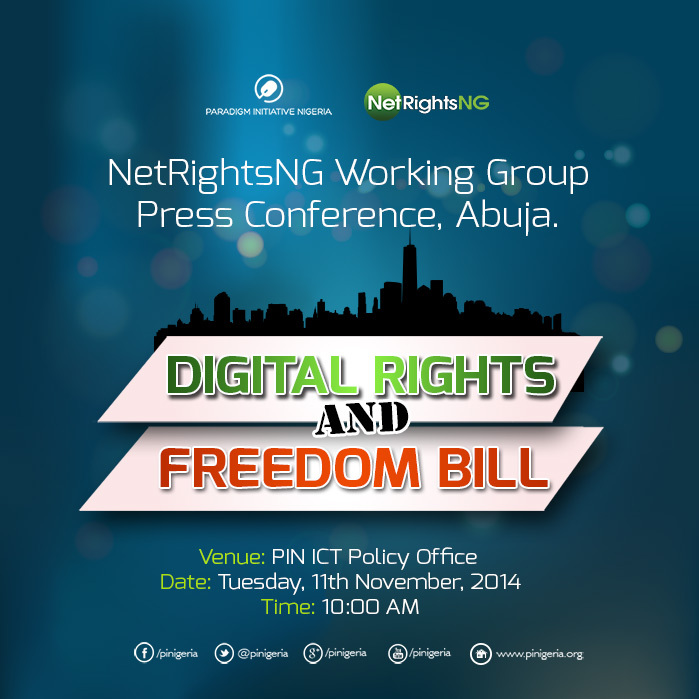 Communications on Social Media platforms linked to the initiatives will generally be tagged #NetRightsNG. A Twitter handle (@NetRightsNg) will also be in service, as well as a Facebook page. 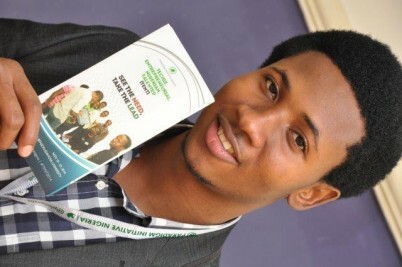 Advance Nigeria’s leadership in Africa on technology. It is expected that by 2019, the National Assembly of Nigeria would have voted the Bill into law, setting the pace for and hopefully encouraging other African countries to the same.